This sterling silver Scottish Terrier charm is a special piece of handcrafted jewelry. 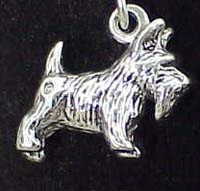 Each Scottish Terrier charm would be a gleaming addition to any Scottish Terrier jewelry collection. It makes a nice Scottish Terrier gift item. Approximate size on the Scottish Terrier charm is 1/2 inches. Small Scottie Pin in Crystal/Lt Siam with a 23K Gold finish. This Austrian Swarovski Crystal jewelry piece by renowned artisan Dorothy Bauer. Each piece is constructed and soldered by hand. Comes in your choice of finish. Jewelry and pet jewelry and collars by Dorothy Bauer are highly sought after and collectible! Xsm Scottie Tietack in Crystal/Lt Siam with a 23K Gold finish. Large Scottie Pin in Crystal/Lt Siam with a 23K Gold finish. Large Scottish Terrier 3D multi-color Enamel Sterling Silver Charm is available from jewelbasket.com for only $123.68. Buy now and save. Jewelbasket offers the best value on , jewelry and gifts. A fun, lively piece to compliment any charm collection. A playful canine crafted in sterling silver comes fully accessorized with a gleaming 14K gold sweater and a sparkling, diamond accented collar. Piece measures 7/8 by 11/16 inches. Sterling Silver Enameled Small Scottish Terrier Charm is available from jewelbasket.com for only $100.91. Buy now and save. Jewelbasket offers the best value on , jewelry and gifts.